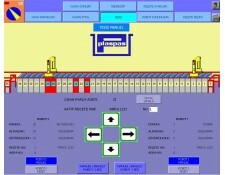 PLANT AUTOMATIONClick Here For Automation User Manual Finishing Plant automation software is Windows-based.System is controlled by computers (WIN AC SOFT PLC) at the center and by SIEMENS S7-200 PC’s for robots The most distinct feature of the automation system is that it’s an open programme and it controls the entire plant by means of recieps,which allows the operator to operate the plant with the recipes simultaneously. Microprocessor controls the automation of galvanazing and surface finishing systems individually programmable for all process parameter.Connection to master,communication and with process visualization systems are avaliable at any time.Individual costumer needs concerning system controls can be satisfied due to our expensive software experience. Rectifier and resistor heating values,pumps and motor groups are also controlled by PC. ..